Put a little bit of oil, pork rib, 2 slices of ginger, saute in a large skillet. Then put a little bit of cooking wine, 2 tablespoons of light soy sauce, 2 pieces of crystal sugar, 4 tablespoons of white vinegar and a little of bit of dark soy sauce to help colouring pork ribs. Pour boiled water into the skillet until the water level cover all the pork ribs, turn down the flame of the stove, put the skillet cover on and wait for about 30 minutes until the water become sauce. Finally, put the white sesame for decoration. A very simple recipe but yet it looks delicious, I will definitely try. Sounds simple enough. I don’t eat pork but will try it on fish, with modified ingredients. 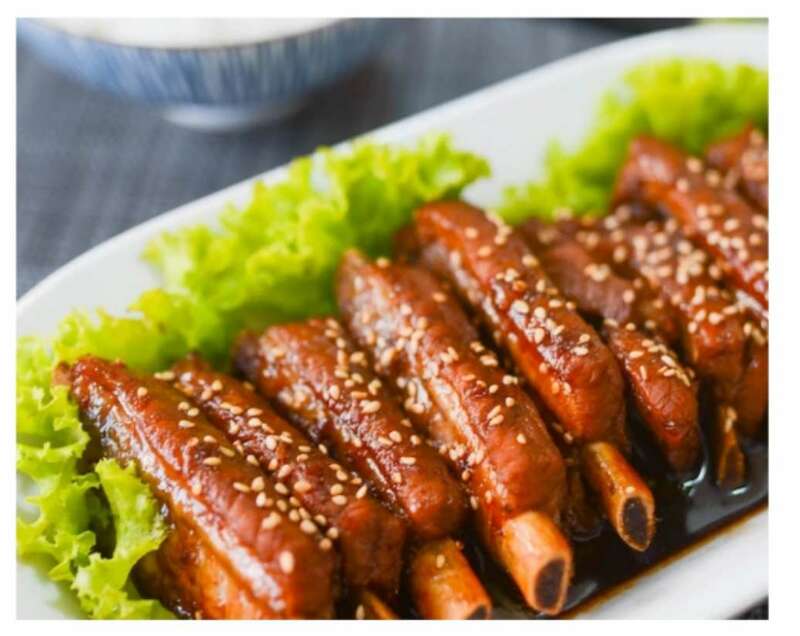 I love pork meat s for sure, these yummy pork ribs would be welcome. I love the sesame toppings. I love how you list out the recipe in such a simple, easy-to-follow way! And oh my goodness, does the final pork rib look so incredibly amazing and delicious! Looks perfectly made, and such an easy recipe to follow, yet so delicious! Having grown up in Singapore, I can totally appreciate this recipe! I don’t eat pork, but the pics definitely make it look delicious. Will have to pass on the recipe to my pork eating friends. You can replace the pork to chicken which make it “Americanized Asian Food” – The orange chicken. I have tasted the chicken version of this and it’s very tasty. I didn’t know it was easy to make. Thank you for sharing the recipe. Will try to make it.